Midnight black Aspire E5-571-588M is a 15.6 inch laptop with the solid performance of Haswell Intel i5-4210U processor, decent multimedia tools and connectivity options for an enjoyable mobile computing experience, as part of the Acer E Series and it is quite an affordable model for an i5 processor PC- one of the best you can get at this price level. 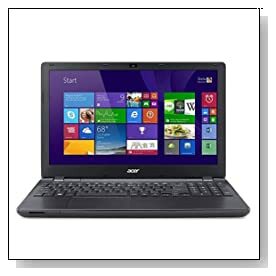 Acer Aspire E5 comes with the dual core Intel i5-4210U (3MB cache) at 1.7GHz speed up to 2.7 GHz with turbo boost, 4GB DDR3 SDRAM, 500GB SATA HDD and 64-bit Windows 8.1 OS with its Win 7-like start screen with Start button with a little different functionality. Both 4GB memory and 500GB may appear as standard but both will be more than sufficient for day-to-day tasks, multitasking smoothly and being able to save all regular and multimedia files. You also have the AcerCloud by which you can use the laptop’s storage as the cloud storage and have access to your files wherever there is internet connection and on whatever device. 15.6" HD CineCrystal LED-backlit Active Matrix TFT Color LCD widescreen display with 1366 x 768 pixel native resolution and 16:9 cinematic aspect ratio for better viewing or via the HDMI port you can view your laptop screen on your large HDTV and you can easily keep in touch with family and friends via email or Skype chats on its high definition webcam with an integrated microphone which allows you to also take still snapshots. Immersive sound through its powerful speakers for music, videos and games. Graphics card is the integrated Intel HD 4400 and don’t expect this to be a top of the range gaming PC- it will run older titles fluently and you can play some of the latest titles at lower settings. Modern and functional design black Aspire is a bit more than 1 inch thin and weighs around 5 pounds so it is rather portable if you’re out and about a lot. You’ll get up to 7 hours of battery life from its 2500 mAh 6-Cell lithium ion battery. You have the comfortable Acer FineTip keyboard for accurate typing with less errors and numeric pad on the right hand side as well as the intuitive Precision Touchpad that is optimised for Windows 8 functions to navigate through the web sites, apps and multimedia content easily. There is no Optical Drive but 802.11b/g/n wifi wireless, Bluetooth 4.0, Gigabit Ethernet, an HDMI port, a USB 3.0 port for up to ten times quicker transfer of data than the standard USB 2.0, 2 x USB 2.0 ports, a VGA port, Audio Line Out and Memory Card Reader that supports Secure Digital. Conclusion: Acer Aspire E5-571-588M is quite a fast computer with good performance levels in various tasks for its price range and has great video and sound quality as well as a good variety of connectivity options despite the lack of optical drive- but will you really need it and when was the last time you used it on your PC.? It looks pretty good and has kind of a premium feel although it is made of solid plastic. 4GB RAM should be adequate for daily tasks of an average computer user but it can be expanded up to a max capacity of 16GB with two memory slots. Intel i5-4210U is the processor you’ll find on the 2014 model budget Apple iMac so it will have to be powerful enough for a laptop if it can run an iMac desktop just fine. 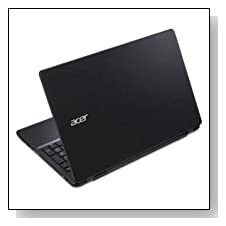 It comes with a 12 month limited warranty by Acer- the international travellers version.